I cooked this dish at the weekend and it makes a perfect light supper or lunch which can be eaten on its own or as an accompaniment to grilled meat or fish. I wanted to share this one with you as it’s cheap, easy and healthy, putting vegetables centre stage rather than as the backing group. 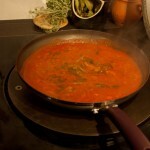 By oven cooking, the veggies retain their flavour and their vitamins are not poured down the sink with the boiling water. 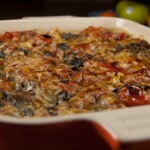 The dish involves thinly slicing the ingredients and piling them into a multi layered bake. I’m always on the look out for different gadgets to make prepping and cooking easier and recently purchased a couple of new peelers called Sharp Peel. Although in the past I’ve used a mandolin I tried the extra wide vegetable peeler to see whether it would be quicker. It is scarily sharp and sliced through the vegetables like butter, so the vegetables were prepped in super quick time. They were thinner than when sliced on the mandoline and looked like ribbons which made the layering more difficult. In future I will stick to making them slightly thicker for this dish. But the gadget would be great for making salads such as coleslaw or delicate edible garnishes. You can see how pretty the slices of veg looked in the photos above. Slice all the vegetables thinly and keep in separate containers. In a separate dish grate cheese and add breadcrumbs and parsley. 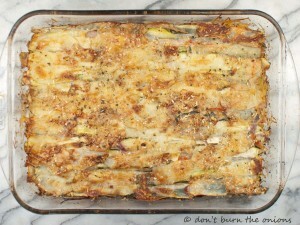 Start building your layers by alternating the vegetables with the cheese mixture and a drizzle of oil. Starting with potatoes, follow with a layer of carrots, then pepper, then onion, followed by potato and finishing with the courgettes. Continue until all the vegetables have been used. Between each layer sprinkle the cheese mixture and a drizzle of oil. Cover and put in oven for about 25-30 minutes. Uncover and cook for a further 10 minutes or until the vegetables are soft and cooked through. 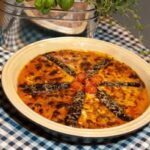 This entry was posted in All Recipes, Vegetarian and tagged cheese, family, Food blog, healthy, Mediterranean diet, pepper, potatoes, Recipe by dontburntheonions. Bookmark the permalink.